There is no shortage of nightlife in Glasgow. It has been described as the Scottish Las Vegas due to the number of casinos in the city, proposing a large selection of card games, slot machines, roulette tables, blackjack and much more. There are seven casinos in Glasgow and five more on the outskirts of the city. The Gala Group owns three casinos, including the very popular Riverboat Casino open from 3pm to 8am seven days a week. Not only does it have a large number of tables in the cardroom, it also offers fine dining and fabulous views over the River Clyde. The Gala group also has casinos on Sauchiehall Street and in The Merchant City. Another popular Glasgow casino is the Alea Casino, bringing a Stateside casino touch to the city. There is a Vegas style casino, a VIP gaming room and stunning bars and restaurants providing live entertainment within the complex on Springfield Quay on the south bank of the Clyde. It is also possible to rent the Red Leaf dining room for unforgettable private events. The Sandyford Hotel on Sauchiehall Street is perfectly located for visitors who come to Glasgow to enjoy the atmosphere of the city's casinos. Our 3* hotel has 55 bedrooms and 24 hour reception services for your convenience. 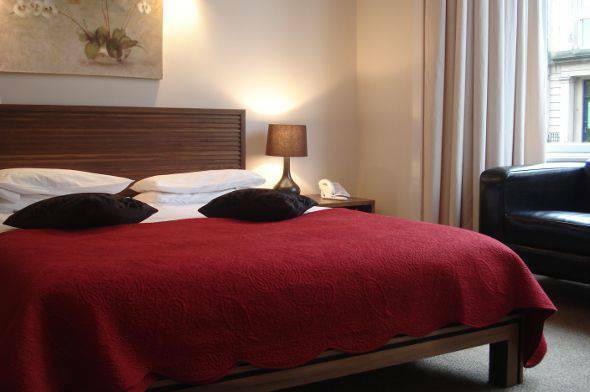 The hotel is centrally located between the City Centre and the West End of the city. We offer affordable B&B accommodation with full Scottish breakfast and the quality of our welcome is second to none. Book a room at The Sandyford Hotel today as the ideal cheap bed and breakfast option for a visit to Glasgow casinos. We will be happy to advise you on room availability for your choice of dates. Alternatively, you can make a booking enquiry or a reservation with the online form on this website. Place your bets�.on The Sandyford Hotel.